Xian is one of the four great Ancient capitals of China. It was the capital of China during the reign of Zhou, Qin, Han, Sui, and Tang dynasties. Apparently, the city was known as Chang'an before the Ming Dynasty. With over 3,100 years of history, a visitor to the city will quickly find out that there is probably more than he or she can digest in one vacation. Below is a brief overview of the city. 1. The Silk Road starts from Xian City. It also happens to be home to the Terracotta Army of Emperor Qin Shi Huang. 2. With the revival of Chinese Mainland economy, Xian has seen increasingly become a center for culture, industry and education for the central northwest region. 3. Xian is home to China's research and development facilities, national security and China's space exploration program. 4. Xian is the capital of the Shaanxi province and a sub-provincial city. 5. With a landmass of approximately 16,808 km² of urban area, Xian is one of the averagely populated cities in China. It is surrounded by 8 rivers, the biggest of which is River Wei. 6. Amazingly, you will find an unlikely feature in the heart of Xian - the 1250 year old Great Mosque of Xian. 7. Xian is the birthplace of Chinese civilization as attested by museums such as Shaanxi History Museum, Xianyang Museum, Banpo Museum, Forest of Steles Museum, and Fule International Ceramic Art Museum. 8. If you are a visitor, make sure you get to sample foods such as Roujia Mo, Xi'an Kabobs, Guan Tang Baozi, Biang Biang Noodles, and Yang Rou Pao Mo that are served in the Xian restaurants. 9. If not for anything else, visit Xian to learn China's history. It was a capital for 13 empires under 70 emperors. 10. The name Xi'an, as it is written in Chinese has a meaning. 'Xi' means west and 'an' means peace. In full, it is translated as peace in the west. 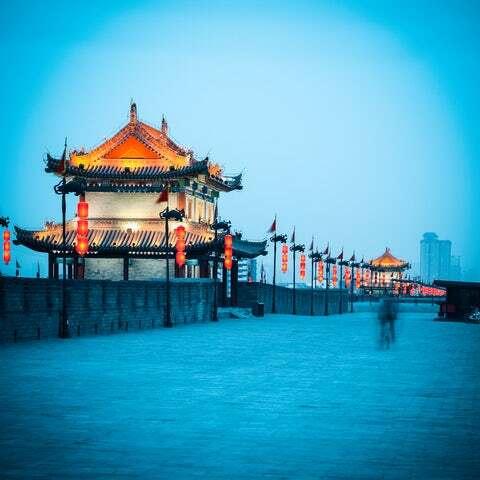 Xian is one of the few cities around the world that can boast a history spanning over 3 millenniums. If I were you, I would make it a must visit during my China tour.